What a lovely event! Members of the International Mahler Orchestra participate in a Plasma concert in Kassel. The social institution Frauentreff Brückenhof e.V. 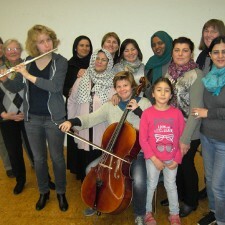 organized a classical concert for local female immigrants. These women have barely had any connection to classical music which is the reason for their special motivation and interest in this opportunity. In the context of multiple meetings with the Musicians of the IMO they were actively involved in the conception of the programme. We’re happy to be a part of this extraordinary musical exchange!